for your sports bar/game room area. High impact, eye catching, real glass tube neon sign. This characteristic glow can attract your friends/customers like nothing else, virtually burning your identity into their minds. Neon signs can be left on 24 hours a day, seven days a week, ...for decades. There is no light form around that has the visual impact of neon. Uses quality solid state transformers that are energy efficient (They use less power than a standard 75 watt light bulb) and backed by a full 1 year warranty. 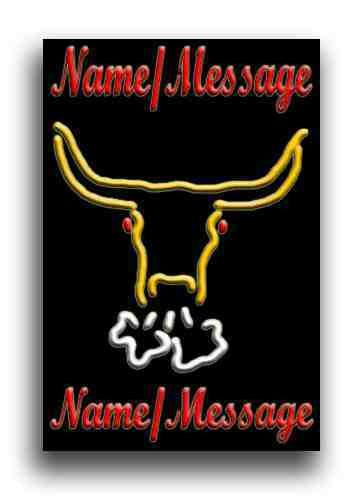 This sign will look great hanging in your Window, Mounted on your wall or sitting on a counter. If you would prefer to pay by Cashiers Check or Money Order, you will receive instructions for this in your confirming e-Mail sent to you after completing and submitting the above "Your CUSTOM NEON Details" form. Or, click on the "PAYMENTS" button on the Nav Bar at the left.